Jerusalem — Making Seder for the extended family seems like child’s play compared with Rabbi Yehudah Glick’s Passover preparations. The New York-born Glick is getting ready to lead world Jewry in a Paschal sacrifice April 18, the first night of Passover. According to the Torah, the Children of Israel were commanded “in perpetuity” to sacrifice a young lamb or goat on the anniversary of the Exodus. But this sacrifice was to be conducted in the Temple, and was therefore suspended after the Temple’s destruction nearly two millennia ago. The arrival of the Messiah isn’t Glick’s only hope for facilitating the sacrifice. He cites a minority rabbinic opinion, contending that the Passover sacrifice should take place with or without the Temple as long as Jews have access to Temple Mount. He is requesting permission to hold the sacrifice there, a request that, until now, the Israeli authorities have denied — apparently fearing an inflammation of Jewish-Muslim tensions. While Israel deems the Temple Mount under its sovereignty, the site is managed by the Muslim Waqf, which, with Israel’s acquiescence, bans individual prayer by non-Muslims — and, by extension, mass communal sacrifices. Glick has twice petitioned the high court, without success, to overrule the police. Last Passover eve, he and one of his goats were detained by police near Jerusalem’s Jaffa Gate. Officers suspected that he was going to try to sacrifice the goat in violation of the law; he insists that he is law-abiding citizen, and was only going to perform a mock sacrifice at an Old City synagogue. Until now, support for sacrificing regardless of the Messiah’s arrival was marginal. But in early April Glick received a call from the office of Chaim Kanievsky, son-in-law of the de-facto chief rabbi of Haredi Jewry, Yosef Shalom Elyashiv, and an acclaimed halachic authority in his own right. 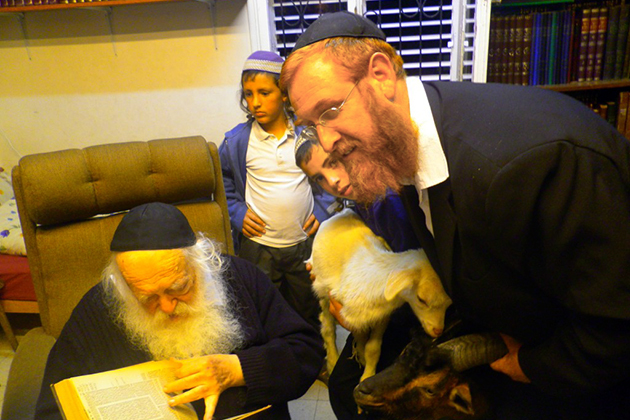 Kanievsky wanted Glick to visit his Bnei Brak home with one of the lambs he planned to sacrifice, and enter via the back door so as not to attract the attention of neighbors. He inspected the animal, asked questions about the program and gave his support. The program also has the backing of Gershon Eidelstein, one of two senior heads of Ponevezh, a well-respected Haredi yeshiva in Bnei Brak, as well as several religious-Zionist leaders, including Haim Druckman, head of the Bnei Akiva network of yeshivas. In the event of the arrival of the Messiah or a U-turn on the part of Israeli authorities, all will be free to watch the sacrifice but only people who paid to sign up to Glick’s program will be able to meet the biblical requirement of eating the sacrificial meat. They are guaranteed the religiously prescribed ounce of meat and a room in Jerusalem, if needed. Glick runs the program under the Chafetz Haim Holy Heritage Temple Foundation, a registered not-for-profit organization established for the purpose, and promises to distribute the subscription money to charities if the sacrifice doesn’t take place. Glick launched his program two years ago, amid a surge of interest in preparation for a Third Temple. The previous year the Temple Institute, a Jerusalem not-for-profit, started preparing garments for priests to wear in a rebuilt Temple, tailoring them according to biblical specifications, and went on to create an altar.